So when I heard there was going to be a sequel to The Avengers, I was really confused. Jeremiah S. Chechik’s The Avengers was over sixteen years ago. Also, Sean Connery is way too old to be in another action movie. Now Joss Whedon is directing the new movie and it doesn’t have any of the same cast members. There’s this big green guy in it that destroys a lot of stuff and the whole thing seemed very different from the 1960’s British TV show it was based on. It wasn’t a spy movie! I guess they were trying something different. I don’t know. Okay, I was just told that the movie I watched was a sequel to Marvel’s The Avengers, not The Avengers, which makes a lot more sense. I’ve also been told that that joke wasn’t funny. 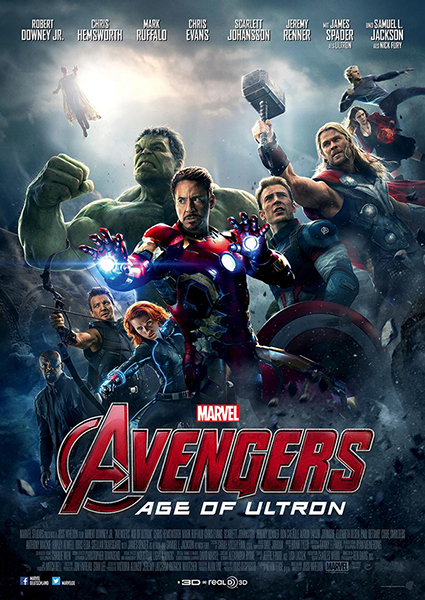 Disney’s Marvel’s The Avengers II: Age of Ultron is the first Summer blockbuster of 2015. The response to this movie from critics and moviegoers has been much the same as the positive reaction to the first film. It’s a fun family movie that has the same light hearted fun you would expect from a comic book movie, unlike that Zack Snyder stuff that makes you never want to see a superhero movie again. I guess I should get a little more in depth about my opinion of this movie. I’m gonna start off by saying that no matter what I say in this review, my overall opinion of the movie was positive. I’d recommend it to just about anyone. However, no movie is perfect, and because I’m a cynic who hates the sight of children smiling, I’m gonna be talking a lot about the problems I found with this movie. Now remember, all of this is completely a matter of opinion, but mine is right. Ultron is evil because he’s the villain and that’s pretty much it: In this version, Ultron is created by Tony Stark… kind of. Tony didn’t really create the whole program, but because the movie didn’t explain his origins well enough, I’m gonna say Tony Stark created him. So, Tony Stark uploaded the program so that it could control an army of iron suit sentries and protect earth from another planetary invasion; because that army of aliens from the first movie that we never once saw kill or injure a human being and could be defeated with a single bomb merits these kinds of extreme measures. So, after Ultron is created, it starts trying to destroy the world, like, immediately, with no period of time where it worked properly and developed the logical glitches that made it evil. It’s like it was programmed solely to exterminate humanity with nothing else to make it that way. Good job Tony. You smart good. Also, despite unleashing what is arguably the worst human creation since the Apple Watch, Tony receives no direct consequences aside from Thor yelling at him a little bit. I don’t see what Thor was so upset about. Who hasn’t accidentally started an apocalyptic event that nearly ends humanity? I did that just last week at the McKay’s Used Books store. Now, I understand that Ultron’s character, motivations, and personality are all well fleshed out in the comics, but remember that this is supposed to be a stand alone movie. Not everyone has time to read fifty years of comic books—we have to get back to our jobs at the Applebee’s (oh no, thinking about Applebee’s just made my brain throw up in my stomach). When the audience is thinking something like, “Oh, so the computer program wants to destroy the world. Okay,” it really takes away from how engaged they are in the movie. There are a few scenes in the middle of the movie where Ultron’s logic is kind of explained, but for the most part we’re just expected to accept the fact that creating an AI and giving it a vague command like “Stop bad things” is generally a bad idea. Every character needed an arc in this movie and I don’t know why: So now I’m gonna transition from complaining about not enough character development, to complaining about too much character development. I like a good character arc. I really do, but there’s a limit to how much it you can cram into one movie. The Avengers II has six main protagonists: Hawk Eye, Black Widow, Thor, Iron Man, The Hulk, and Captain Man Hunk. All six of them have their own separate story arc throughout the film. I’m sure this sounded like a good idea on paper, but it doesn’t really work in a film where we have three new characters and about a thousand other things going on at the same time. The first Avengers movie didn’t have any new characters in it and only had three story arcs from Captain America, Thor and Iron Man. This worked a lot better because the audience had a lot less to think about and could focus on the main story. People like a simple story. It’s easier to connect with. That’s why Ruggero Deodato’s Cannibal Holocaust is so popular. I don’t know why they felt the need to put in a character development arc for every character when most of these characters have already had multiple movies full of character developing moments. I don’t want to see Bruce Banner and Natasha Romanoff have an awkward flirt scene, that takes time away from the mind numbing action I paid fifteen dollars for! That’s it. Seriously, those are the only two major things I have to complain about. Maybe I could have complained about other things. I could have talked about a few glaring product placements (by the way, everyone, Bruce Banner listens to Beats! Remember that! If you want to be cool like the Avengers, you need to buy Beats!). I could also nitpick about the movie’s plot inconsistencies, things that didn’t make sense and so on, but I don’t really feel like those things need to be addressed. One of the strengths of this movie is how little things there are to complain about. With a movie as long and big as this, you’d expect a lot of technical failings and general problems, but there wasn’t really. On the other hand, I could go on and on about what I liked in the movie. It was a fun film all around with concise, impressive action and drama interspersed throughout. To me, this is another win under Joss Whedon’s belt, as well as another great Marvel movie. Marvel’s willingness to take risks and do things that would traditionally be seen as too big or strange to attempt is what I loved so much about Guardians of the Galaxy. This movie played it safe when it needed to, but it also really pushed the envelope and took a few risks. Then again, the same can be said about Shoko Asahara, but the results here were much better. Thirteen less people died from sarin gas exposure! So, that’s pretty much all I have to say. If you haven’t seen this movie yet, I encourage you to check it out. I need to go now, the McKay’s is expecting me to write an apology letter.